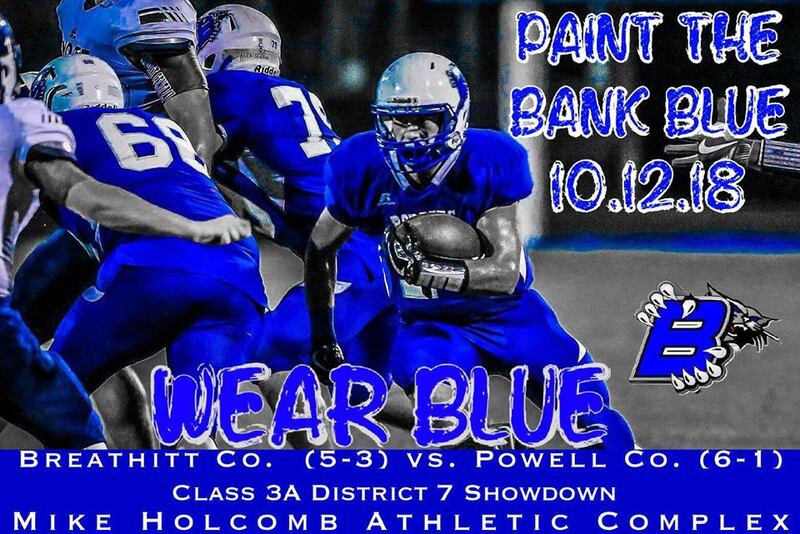 High School Football – BREATHITT and POWELL Set to Battle for The District Crown on The River Bank! 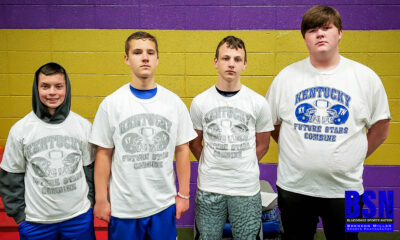 It is no secret that the Breathitt Bobcats are on the hunt for a District Title. Coach Kyle Moore and his Bobcats have been very open about their goal of winning the District Crown this year. 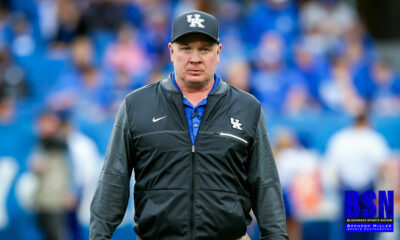 After starting the season 0-3, the Bobcats have maintained their focus and the task is at hand. Since then the Bobcats have won five (5) consecutive games and are 3-0 in District competition, besting Knott, Estill and Morgan. As quiet as this winning streak has been around the Commonwealth, there is a buzz around Jackson that hasn’t been present in years. The Lumberjacks are dominating, the Middle School Bobcats just secured their first winning season in many years, and the High School Bobcats are returning to their winning ways. The future may be bright for the program, but to this group of Bobcats, the future is now!!! The Bobcats have put themselves in position to reach their goal of a District Title and to secure home field advantage for the first two weeks of the playoffs with a win. However, the Pirates are intent on repeating as District Champs and secure playoff position under first year Head Coach Joshua Kincaid. The 6-1 Pirates are led by do-it-all Senior tailback, Nathan Skidmore. Skidmore is having a stellar Senior campaign as through seven (7) games, he has rushed 142 times for 1458 yards and 20 touchdowns. Skidmore has also caught 7 balls out of the back field for 119 yards and 1 touchdown. In the Pirates only loss of the season, Skidmore was held just under 100 yards rushing. Breathitt, on the other hand, have won many different ways and tend to put the ball in many different hands. Braxton O’Hara has completed 39 of 91 passes for 902 yards and 11 touchdowns, for an average of 23 yards per reception. O’Hara does most of his damage on the ground as he has churned up 683 yards on 124 attempts and nine (9) touchdowns, for an average of 5.5 yards per rush. Tyson Gross has rushed 94 times for 735 yards and 11 touchdowns, averaging 7.8 yards a carry. Dalton Manns has been a bruiser himself rushing for 360 yards and 2 touchdowns on 48 carries. That’s good for an impressive 7.5 yard per rush average for the team. Brandyn Slaughter has been O’Hara’s favorite target as he has caught 30 balls for 606 yards and 6 touchdowns. Slaughter has proven to be a deep threat averaging 20.2 yards per reception. Keep Nathan Skidmore under 100 yards rushing. Don’t miss tackles. Wrap up and Finish. Don’t turn the ball over. Win the battle at the line of scrimmage. Breathitt can all but secure the District Title with a win this Friday night. With a win they can also secure their first winning season since 2013. Powell won last year’s district crown and ultimately made a regional finals run before Justin Haddix and the Corbin Redhounds ended their season. Nathan Skidmore and the Pirates are looking to maintain their dominance in the Class 3A District 7. The Breathitt Bobcats will also be honoring a hometown Hero. Colton Ritchie who passed away earlier this year due to DIPG (Diffuse Intrinsic Pontine Glioma) has left a lasting impact on this community. What started out as a way to raise money for Colton’s treatments has turned into a Non-Profit Organization that helps families with financial assistance who have children battling DIPG. The Organization is known as Team Colton! Since becoming a Non-profit Organization, Team Colton has raised over 7,000 dollars. This is prior to any of their major fund raising events. Team Colton is also pleased to announce that they will be able to start award families grants in the near future. Team Colton plan to visit the children’s hospital on Valentine’s Day and deliver bears in Colton’s honor. If you would like to donate to Team Colton you may do so several different ways. You can directly send the funds by pay pal at [email protected] or by mail at; PO Box 520 Jackson Ky, 41339. It will be an emotional night on the River Bank, for both the remembrance of Colton and for football. As we remember Colton, and cheer on the Cats in the biggest game at the River Bank for many years, we at Bluegrass Sports Nation want the fans to be involved on Friday Night and ask all the Fans to “Paint the Bank Blue” by wearing your Bobcat Blue and cheer Colton’s favorite team to victory. As always, If you are unable to attend, you can stay connected to all things Bobcat football with BSN by liking our facebook page, and by visiting our website at www.bluegrasssportsnations.com. Stop by and let these sponsors know how much you appreciate their support of the Bobcats and visit them online!! !